On our continuing travels we’ll be speaking at a Popular Mechanics event in Houston’s Reliant Center, right near the football stadium. 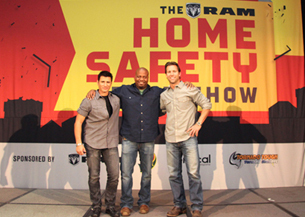 Sponsored by Ram trucks, Popular Mechanics is gearing towards storm preparedness and we’re fortunate to share the main stage with popular TV celebrities like Mykel Hawke, Chris Grundy, and Colby Donaldson. It’s been a warm winter and spring, so we can expect more hurricanes along the Gulf Coast and Houston could just be ground zero, so head on down to listen to us talk on survival medicine Saturday afternoon 6/2, and check out great products and vendors to help you get through those storms!